One of my most popular recent articles is my comparison of two handy portable digital audio recorders. Both the Sony PCM-M10 and the Olympus LS-11 (previous model LS-10) offer the possibility of superior recording quality and flexibility in a unit that fits in a coat pocket and can be carried in one hand. There are many similar units by other manufacturers on the market, but these have the best overall mix of features, ergonomics and sound. Try as I might, I still own both of them -- I just cannot decide which is the ultimate tool. Neither can my readers, a fact which has generated a good amount of conversation around the previous article, both on the web and in private emails. In this post I will address some of those concerns and articulate my thoughts in a different way. To start, here is a quick comparison of the Olympus LS-11 versus the Sony PCM-M10. For more details see the previous article. In summary: The Sony has the most uncompromising sound quality and low-noise mics that are better for ambiance. The Olympus has the better build quality and usability, with mics that are better for most common uses, including interviews and solo musicians. That's why I have both, actually. 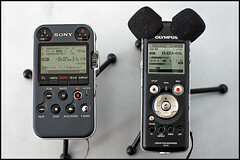 The Olympus gets used for interviews and the Sony for external mic recordings where ultimate fidelity is a requirement. ...then these are great tools. Just look at some of the comments from the last article. "I am an ornithologist working in a tropical rainforest..." "I'm an aspiring opera singer and I'd be using the machine to record my practice sessions..." These devices have many applications. Some of the recordings I made with these made it into my Masters thesis composition. I can assure you that the sound quality in no way impeded my progress with the adjudicating panel! So, yes, these can be professional tools when used within their limitations. And what are these? The microphones, mostly. If you want better recordings then get better microphones. If you need to capture a bird song in the distance they you need a parabolic reflector. If you are tracking video then put a shotgun on a boom and target the speaker. If you are doing street interviews get a solid dynamic that can take rain and a bonk on the head. If you want ambiance then find the mic with the lowest noise floor you can. It is all about mics. And the microphones can cost many times the price of the recorder. And then you will need cable adapters, stands, wind shields and maybe an external power supply. Pretty soon the recorder is the least of your concerns. At this point getting a diploma in audio engineering starts looking like a pretty good upgrade to your equipment! This is why I cannot offer any definitive advice to people looking for a recorder and microphone combination to use in a specific context. This depends on budget, degree of knowledge required on the part of the recordist and the specifics of the recording situation, none of which I can easily assimilate into a Yes or No answer. I have experience with my gear in my situations with my knowledge base. This is unlikely to directly transfer to you. Still, I do my best! One of the previous respondents referenced the Wingfield site and their comparison audio files. Despite the care they took in setting up the recording sessions (and the tasty cello playing) there are two problems with comparing recorders based on what you hear on their site. First, you are listening to compressed MP3 files, and not even that high a bit rate. If I had to use mp3s I would prefer 320kbps to 192kbps. But I wouldn't use MP3s, since these have the very obvious effect of removing difference. Recordings will inevitably sound more similar than they would in their original uncompressed format. I can understand that they do this for bandwidth reasons, but I wish they provided the full suite of recordings for download in uncompressed PCM files, possibly using a third-party site like archive.org. The second issue is that these recordings will tell you more about the quality of the built-in mics than the capabilities of the recorders themselves. As I have already said, the microphones are the weak link in the chain; none have stellar frequency ranges or flat responses. Thus these recordings only act as a rough-and-ready indicator of the great sound (compared to previously technologies in this price range) that all of these recorders manage. Unfortunately I don't judge them as useful for any other purpose. For a quick overview you can read my article Capturing Sound For Video, which outlines the usual upgrade path, from built-in mics up to a professional rig. I also have a summary of Interview Microphones. Other good resources include the Nature Recordists and Phonography Yahoo groups. Let's continue this useful discussion below. Share any particular successes you've had with these recorders and specific mic combinations. And if this has been useful to you, saved you time or bother, then please donate a small amount using the button in the sidebar. Thank you! I purchased the PCM-M10 based in large part on your excellent reviews and the wingfield recordings. I'm a complete audio newbie but there are times a year that I want to get a good hassle-free audio recording. And let me say from a newbie's perspective, the Sony interface is so ridiculously complex and counter-intuitive that I would not recommend it to anyone. I've recording sounds that I didn't intend to record, and failed to record rare and precious sounds that I wanted to record. IMO, the only way that the Sony PCM-M10 is workable is if you use it a few times a week so you can master its interface flaws. No doubt I am spoiled, since I remember when MiniDisc recorders would automatically overwrite your last recording unless you remembered to push an additional key -- was it FF? I have not found the M10 to be as annoying as you, though it is certainly not as easy as it should be. Thanks for your input! I understand the built-in mics are greatly responsible for the sound we get out of the different recorders on the Wingfield website, but I cannot invest in both a recorder and an external mic at the moment, so I'll be using the internal mic for a while, that's why I wanted to know which one of the two recorders had the best built-in mic. I have no idea what OU is, but if it happens to be Ohio University I can say that I twice visited Toledo, but never made it to Athens. If money is tight, buy the cheapest recorder and bank the rest for a future microphone purchase. If you will be using the built-in mics for recording vocal practises, get the LS-10/LS-11 (first is cheaper). The more directional cardioid microphones should present a more immediate aspect of your vocals. Noise floor is higher but that is not an issue since the signal you are presenting should be plenty loud. At least, if I know anything about opera! You should try to get yourself into a studio with a trained recording engineer. You may be able to do so for free if you are in proximity to a school for same. Offer your vocal services to a class of audio tech students. You will learn a lot about your voice and which mics get you the sound you want. Even if the price of these seems astronomical it will be useful information in the future. Hi again... it's the aspiring... Well, thank you so much for all your pieces of advice. I still can't decide... I'm terrible!!!!... I know. Well, could that be linked to the fact I'm a girl? The OU I was talking about was the other one: the University of Oklahoma (and when I asked, I thought you were in the US, not in Europe). I have one more piece of information that could be useful: my pianist and I recorded our last practice on her Zoom H4 and the sound got completely saturated on the higher notes. Could that be a problem too with one of the 2 recorders you are discussing? Last question (hopefully): from what I read somewhere else, the built-in roll-off of the LS-11 does not disappear when one use external mics. Do you agree with the idea that if one wants to invest in external mics, one should rather get the Sony? I'm pretty sure you're wondering what I was recording on so far. Well, I don't even dare telling you!!! I am surprised "the sound got completely saturated on the higher notes" since I would have assumed the lower notes would overload the pre-amps first. But maybe the recorder was closer to the top end of the piano. In any case, this can easily happen with any model. It's best to do a sound check and determine where the highest amplitudes are -- set the record level accordingly, remembering to switch to Low Sensitivity if the sounds are loud (as they would be here). Mic positioning is a key factor. If you are further from the piano/vocalist you might get a nicer blend of both plus the room sound... a more "musical" result, assuming the room sounds nice! Moving closer to the sound source(s) will give you more clarity if you need to be analytical about the recording. But this will emphasise dynamics and run the risk of overloads. It seems to be true that "the built-in roll-off of the LS-11 does not disappear when one use external mics." However, this can actually be an advantage in those situations where you might use bass roll-off deliberately. I think Olympus did this to make it easier for beginners to get a nice recording without overloads due to rumbles, wind and other detrimental "noises". Of course, as a recording engineer I prefer to make this choice myself -- I don't want my equipment dictating limitations. So yes, the Sony is superior in this regard for sources like piano where you don't want the lower octave(s) rolled-off. P.S. Never been to Oklahoma. Well, the sound got saturated when I sang loud higher notes, whether the piano was playing or not, so I guess it's not related to the position of the mics relatively to the piano. So I'm going to follow the advice you gave me a few days ago and I'll go with the Olympus. Thanks for the great reviews and comments. I just got my M10 a couple of days ago and have been recording my own voice with it, and I've decided to use the M10 as my portable MP3 player as well. I have a question, or rather I need help with one thing. Regarding recording levels and mic sensitivity, I don't know if I have a defective unit or not. With the Rec Level selector turned set to manual and the Rec Level knob rotated to 10 (maximum), I'm recording my own voice at a distance of approximately 18 inches from the mics. I speak with a moderately loud speaking volume, similar to having a lively conversation with a large group. The sound level in my recordings reaches only about -22db on average, peaking around -18db. Because of this, I wish there was a way to turn the record level even higher so I can make louder recordings. Is my unit defective? Oh, the Mic Sensitivity switch is set to HI as well. I am considering purchasing an external mic with higher sensitivity, but, I expected to also be able to rely on the built-in mics. Would you care to comment on this? Thank you. The M10 has otherwise performed very well and I am satisfied with it in most other respects. Ok, I'm the guy who posted the Record Level problem (recordings too quiet) above. The issue is solved! Believe it or not, it seems my Rec Level potentiometer/knob needed some breaking in. For no particular reason, I turned the knob back and forth a few times before making a recording this evening, with the thought that the potentiometer/knob might wear-in a little. After I made the same voice recording with the Record Level on "10" again and with the mics positioned 18" from my mouth, I was rewarded with a Record Level that was so loud it completely clipped 0db! Thereafter I needed to turn the Rec Level knob to "4" or "5" to get it within a good range. No more quiet recordings anymore, this M10 is working perfectly now. Ah good! I was getting ready to test that on my quiet Sunday but you saved me the effort. I was wondering: the deck I got doesn't have the plastic that usually covers the screens of new electronic devices. Do you remember if yours had one, please? (I don't want to have gotten a refurbished deck instead of the new one I paid for). If the Olympus people are still reading this post, they can answer too, of course (if you would allow, Robin). Aspiring: I honestly don't remember a peel-off protector. But that's really testing the old noggin'! I have never had a problem with the M10 but don't use any of these units enough to really stress them physically. I agree that the connection point is not ideal but as one should never touch a unit during recording I don't let it bug me. To me, anything without XLR connectors is a compromise anyway! Sorry I cannot compare with the PCM-D50 as I have never used that unit. But I don't think any unit has the low noise floor of the M10. I'm interested in the M10 because I want to record people playing music at outdoor music festivals so that I can learn the tunes. The M10 has the ability to play back at a slower speed at the original pitch, split files, and easily mark sections to repeat. Do the Olympus models have any similar capabilities. Ordinarily, I don't have access to these capabilities until I return home and put the files on my laptop. So being able to do this the morning would be a great advantage. Perry: The LS-10 does have "segment repeat" with a dedicated button. The LS-11 additionally allows you to mark points in a file while recording, so you can later skip to them. You can also divide files at any point once recorded. But it still doesn't have a function to change the playback speed, so if that's what you need, better stick to the M10. Stefan: I could be wrong, but the LS-5 appears to be simply a stripped-down LS-11 they can sell at a cheaper list price. No pouch is included and instead of the bundled version of Cubase one gets their own app, Sonority, which could never be as good (but which does run on Max OSX apparently). There is also only 2GB internal memory. I see it selling for 180 EURO, compared with the LS-11 at 270. Seems a good deal! But it would be even better if Olympus improved some of the shortcomings of their range, providing a compelling reason to choose them over Sony. As for making test recordings, the difficulty in doing this right gives me pause. One clarification: I am trained as an audio engineer but do not work as one. Otherwise I would have lots of opportunities to get these units into a studio. First off, let me congratulate you on a simply superb set of reviews and comment (including the above comments). I play flute (advanced) and violin (beginner) and am looking for a unit to replace(/expand) the BOSS Micro BR I got a while back. Unfortunately I didn't research much before buying the BOSS and have found it's really a guitar practice unit: although packed with features, I never use half of them. I would be recording band practice sessions (all-acoustic, but with a wide range of tonal colors and ranges: bodhran, double bass, tin whistle, concertina, banjo, etc.) or recording myself alone playing flute/violin. I would like to just ask a couple of questions about the LS-11 and Sony. Specifically, on-board speakers. For the LS-11, you state "These are useful only to quickly confirm that you have a signal; use headphones to listen properly." Are they really that poor? I know it's probably expecting too much, but I would love a machine that would play a backing track for me to listen to without having to use headphones. Olympus boast that the speakers give the LS-11 "a wonderfully full and vibrant playback". Now the M10, interestingly, has a "speaker carry case" – the CKS-10 I think it's called. Do you have any idea if that's any good? I can't find specs anywhere (including on Sony's site). It's another 80 euros, but might be an interesting option, even if passive. The lack of a metronome and tuner on both machines is a pity although there are simple workarounds for these, however. But I would be interested in a subjective opinion of the speaker capabilities (incl. the advanced CK10 option). Hi Ed: Yes, the LS-10/11 speakers are totally useless for proper listening. Their marketing people really went over the top with the hype there! I have never heard the CKS-10, but know that the quality of this type of little speakers (of which there are hundreds of models) vary from abysmal through acceptable to "not at all bad, better than a transistor radio in any case". With luck you can find some reviews you can trust? I've spent a while trawling the net and confirming your opinion – the best review was actually from the Japanese Amazon site (gotta love Google translate). Oh well :=) I'm pretty sold on the Olympus though in all other respects and will be seriously considering it when I buy in a few weeks' time. After a lot of listening to web samples and reading specs until my brain aches, I think the LS-11 pips the Sony PCM-M10 to the post (and is also 50 EUR cheaper here in Germany). I'll come back and report once I have made my decision! I was looking on the net for PCM-M10 reviews, and found your site. Awesomeness. My real reason for needing the PCM-10, is to finally replace (or moreso, compliment) my Minidisc, and Hi-MD recorders. I will be using it for live recording, but mainly for line ins recordings. Have you tried the line in? If so, how was the Q? Once again, great site, looking forward to your response and more reviews! I own two sony m10s and I have no complicated times operating either one of them. Originally I had one m10 and one edirol r09hr but that one was fried and the m10 was cheaper to replace. Obviously if you're using the internal mics of either recorder and you want to record mono, the ls11 is the way to go, but what if you were using a mono mic (like me, sennheiser md46) and had the m10. Your option is to get a stereo cable. That simple. It will make the file seem stereo but obviously still mono. To enter record standby one presses the Rec button. To begin recording, press Play. [...]Olympus system is much simpler, requiring one button and not three. I'm afraid you have something wrong with the recorder if you're required to press three buttons. I only press record and then the pause button to start recording. it is not that field relevant. To say this as a whole is completely false. You never mention the possibility of using a pre-amp to adjust left or right channels independently. You are correct and this even works with cross memory enabled; it will stop recording on the internal memory and start on the external memory without any delay or file corruption. However, with all this said, I am slightly discouraged with the m10 and the sennheiser md46. The md46 doesn't require phantom power so when its plugged in, and the gain is set to around 6 and in quiet situations, there is a slight hiss. Obviously this would be resolved with a pre-amp but that's impractical, so I may try out an ls10 or 11 in a store to see if there is less hiss in recordings. Can I make a comment about people who post anonymously? Why not take a moment to create an identity using one of the supported methods? Or at least add a name to your post. It does become difficult addressing answers to Anonymous when there are multiple posts with that tag, likely written by different people. Mono recording is not about the need for a different cable. For some applications recordists use mono to get twice the recording time from the same amount of memory. If the stream is being recorded as one channel of a stereo file, it uses twice as much space as it needs to. "I only press record and then the pause button to start recording." True! I think the word "two" erroneously became "three" in my review. "You never mention the possibility of using a pre-amp to adjust left or right channels independently." That is true, as it makes matters too complex if I get into discussions of external preamps etc. Most would prefer to use these small recorders as they are. I would recommend that one buy a better and bigger recorder to get a better preamp, which saves the need for extra cables and points of failure. And then you get important "bonus features" like phantom power, XLR inputs, etc. However I do realise there are applications where one might want to do otherwise. "The md46 doesn't require phantom power so when its plugged in, and the gain is set to around 6 and in quiet situations, there is a slight hiss." All other factors being equal, condensers which work on lower voltage will have higher self-noise. The microphone itself, and not the recorder, is the source of this. It's the price we pay for convenience. I have indeed used Sony Minidisc, in fact right through their development lifecycle, from quirky and proprietary devices to completely serviceable WAV recorders. One issue I always had with them were the tiny buttons that made usage slippery in live situations. These new digital recorders have bigger more obvious buttons and much better ergonomics. I have used the line in on these units and found the quality to be just fine. However I have not done any formal testing. From a -10dBV source I didn't have as much gain control as I might have wished on the M10, but it was entirely sufficient. for the record, I am the most recent Anonymous and my name is sean. :) pleased to meet you! the md46 is just a dynamic mic so it inherently is noisy but, still, when I used the same mic & cable with the edirol r-o9hr (which you were not fond of) it was LESS noisy and more clear than using it with the m10. I am happy to be out of the mini disc stage and onto a more solid recording medium. Hello, I'm the other anonymous from 6th November. Just trying to decide on a suitable recorder for piano lessons and performances. In addition to the Olympus ls11 and sony model, the tascam dr2 has come into the mix. I would be grateful for any advice, especially if it was before Christmas...! Thanks - enjoying the reading. Micheila: For applications like this, where the sound source is quite loud, I am sure any of the recorders would do a decent job. To do a professional job one would have to consider how to mic up a piano, which is a matter of much debate and personal preference. Sean: Thanks for the info. I have not used a dynamic microphone with these recorders and so am not sure what aspect of the gain stage accounts for the increased noise. Thanks very much for getting back to me. I think I'm leaning forwards the Olympus ls11. Keep up the good work. There is a new article available with sound samples. I curious about if there is any difference in the line-in recording and analog to digital conversion between these two recorders, or any other recorder. The reason I ask is that my Dad has tasked me with at least getting him started ripping his vinyl collection. I figure that having a dedicated digital recorder might be better for the initial rip before processing on the computer (de-noise, de-hiss, de-click, etc). My reasoning for wanting to go this route is complicated but essentially boils down to keeping my Dad away from the computer for as long as possible - it's better for everybody that way if you know what I mean. And we may get a nice audio recorder too! So I guess my question is for this purpose would it be worth spending the money for a nicer PCM recorder like the M10 or LS11 or would something way cheaper like the Zoom H1 do just as well if the line-in is what I really want one of these for. Any thoughts would be appreciated, Thanks! Dave, maybe others have more experience with this. I have never strictly compared line-in recordings and wouldn't know how to start! I think any of them will do a very decent job. Which do you think would work better (just using the built-in mics) for recording ambient sounds such as the ocean and the rain, etc? Martin: For that specific application I would vote for the Sony, since it has lower self-noise in the built-in mics (lowest of any recorder AFAIK). The fact that it picks up a wider soundstage is also advantageous when you want to capture an environment and not a specific sound isolated from its environment. I sometimes carry the M10 for this purpose with a shotgun mic I can plug in for those times I want a targeted recording. Best of both worlds! Following last coment I would like to ask you whitch of the recorders would be better to record pipe organ in a church. I am organist, and I would like to record the organ putting the recorder in front of the organ façade. And sometimes, I would like to record the singing choir, situated near the organ too. As I have read in forums (I am not audio profesional) the better mics to record organ are omnidirectional, to get room sound to. Moreover, I have a minidisc mic (sony EMC907). So, would be a good idea to get M10, to record omnidirectional sound, and in other occasions, where directional mic is recquiered, use the 907? Or do you think that for organ/choir recordings would be a better choice LS-11? Very likely the M10 would be better for the omni mics as you say, and because the more diffuse sound suits church music. Besides which, organ fundamental tones can get very low indeed, and would be truncated by the high-pass filter on the Olympus devices. Thank you very much, Robin. You don't know how you have helped me. With your direct answer and with your great reviews. I'll buy sony m10 then. Thank you again. Please can you better explain about "compatibility with pro input level (+4dBV): NO (LS-11) / YES (M10)"
The main use for me would be to record out from a DJ mixer and sometimes the line signal could be very loud. Why nobody put on the market a small digital recorder with a lot of different imputs, including digital, and sess focused on microphone? Stefano: The line input jack on the Olympus operates at –6 dBv and unity gain is at full scale (10 on the dial). This means the hottest signal it is designed to take is –6 dBv. A comment by violinbf on my comparison page makes the point explicitly that +4dBV is too hot for the Olympus. Perhaps others with more experience can speak to this? There are digital recorders with abundant input options but by necessity these must be larger. There must be physical space for all the connectors on the outside of the unit and for the mounts inside the unit. Different recorders make different compromises. Inexpensive units with high quality inputs include the Sony PCM-D50, which has optical connectors but no XLR, and the Fostex FR-2LE which has XLR but no optical. If you want no compromises get the Sound Devices 702, but that is hardly in the same class of recorders. On the subject of unity gain, it must be 10 on the Olympus LS-10 as I've never yet come across a handheld recorder with such low line-in sensitivity. Unity gain on the PCM-M10 seems to be around 4 on the dial. I think it's an excellent machine, not quite as well made as the Olympus, but better sound quality overall and excellent battery life. yes the mics are too omni and wide but if you place the unit at the right distance, by trying until desired sound is achieved...the sound comes pretty balanced and well captured. I've got a question for you. would the unit power of a condenser mic or a two small diaphragm pair of condensers with the appropriate (Y)cable? Thanks for the comments Nick. I still use the Olympus alongside the Sony, each for their own purposes. Unfortunately Plug In Power (PIP) is completely different from phantom power. PIP devices supply from 2V to 5V, depending on the unit. (Neither the M10 nor LS-10 manuals are explicit about this.) PIP microphones can work on current as low as 0.3 mA. Though the Panasonic WM-61A, for example, requires 0.5mA. Phantom power is specified at 48V, though some microphones can work with as little as 9V. Current requirements usually start at 3mA which is an order of magnitude greater than PIP. Thus the two systems are not compatible. Hi Robin, thanks for the time you've taken with this comparison. I wonder if I could ask you your advice too. I work in Edinburgh as a radio journalist, making sound rich packs and features. I already havea Fosetx FR2-LE with a small collection of microphones, but would like one handheld device as a back-up unit, and so that I can have something on me most of the time to make opportunistic recordings and interviews. Based on all that you have already written, I am probably steering towards the LS-11, or the LS-5 if they are technically identical - I could spend the difference on a silicone cover and a windshied. However, I have niggling doubts based on the audiophile forums, where people seem to favour the Sony. Any thoughts? I would also like to listen to some of your work, if you could recommend some and perhaps point me towards a link. We tend to worry too much about gear and not enough about best practices. Perhaps sites like mine don't help! I have a good deal of experience in radio and so say with some confidence that there is a lot more to choosing a device than which has the lowest noise floor. For this application that is hardly a priority. Handling noise and robust build are much more important for work in the field. Since you already have a shoulder-size recorder with excellent specs, I would choose whichever smaller unit has the features you require. Some people prefer Sony units because of brand confidence. They have been respected for past products like the Sony Pro Walkman and MiniDisc (both of which I used with pleasure). For the same reason people still buy Marantz digital recorders, though there might be better choices; they made serviceable cassette decks back in the day, and catered to journalists. Olympus have traditionally made voice recorders with low sound quality. The brand was not associated with audiophile, audio engineering or journalism applications. So no matter how good the LS-10/11/5 are, they are not going to appeal to people bound by tradition. I have had similar experience trying to convince film and video techs that the Zoom recorders are substandard in both build and audio fidelity. Many of them simply won't believe it! Documented facts will not overcome individual (and group) bias and familiarity. I have done some (little) SFX and film work but mostly perform electroacoustic improvisations. Many of these integrate field recordings. Thank you Robin. I agree with your thoughts about being distracted by equipment - after all, the most important pieces of equipment we have are our ears, and the creativity of our minds. 1) capacity of the internal memory; LS-5 2GB; LS-11 8GB. The LS-5 also lacks the remote. But that only comes with the other models in certain territories - I can't remember offhand if it was N. America or not. I have literally never used the remote I have, though I can see a use for it in certain situations. It makes sense to sell the LS-5 cheaper without accessories and let those who need them buy them. Hi Robin, I have spent hours reading through your articles and the comments that follow and I agree with other commenters that your site is incredibly informative like none other. I love the way you respond to your readers with such openness! Could you possibly recommend which unit would be best? Thanks Rose for your kind comments. I do strive to be open. At least you can be sure I have no vested interests, not being a store or other retail operation. By the same token I cannot try even a fraction of the devices on the market. Rather I rely on the good work of other equipment users and testers. The Olympus LS-3 (in Europe) appears to be identical in every way to the LS-7 (in N. America). How silly is that? According to the tests of the wonderful Raimund Specht, these models have 4 dBu(A) higher noise floor (at maximum gain) than the LS-10/11/5 models. But they are smaller. You could put one in the pocket of your subject, since they are hardly bigger than a radio transmitter. As for which unit is best... I have to repeat that they are all good enough for sound work for video because, to be honest, the bar is not that high in that field. For example, Zoom recorders are popular AV items, though I wouldn't touch them with the proverbial ten foot pole -- or should I say boom? Getting the best sound will require getting close to the source. That's why a lav is perfect for spot pick-up -- even though this type of condenser mic has higher noise floor than others. The second approach is to use a shotgun on a boom, so you can position it above but close to the action. Technique is more important than the specs of your gear, as you no doubt are aware. If you must use a must use a phantom-powered mic then you may as well avoid a separate XLR unit and get a recorder with XLR built in. I avoid this necessity by using the battery-powererd K6 / ME66, since this combo is good enough for me. More expensive XLR shotguns are better, however, there's no doubt about that. Ok, so I guess I will go with the xlr inputs then. Thanks for replying! hi, I am been looking for a good solution for a long time , maybe you can help me. we are looking for a portable recorder to record lectures and sell the recording to the public (MP3, high quality). Budget around 400$. The recorder will be on the belt of the lecture + a mic near his neck. We want to record only his lectures not the comments of the students. The lectures are in class rooms/halls. Which is better? Do you have a other solution? I need help! I would take the best advice of the specialist you are consulting with. Both mics are omni lavs designed exactly for your purpose. I see nothing wrong with them or the recorders. Likely there are subtle differences in how they interact and the resulting signal gain structure. But isn't the B3 phantom-powered? Maybe there is a variation that runs either on battery or the PiP of the recorder. I am not that familiar with this application. By now you and your posters probably already know that Olympus has recently unveiled a new product, the LS-100, which will be available in February with a $399 list price. It seems to me from what I've read that Olympus has paid close attention to the suggestions that you and others have made in response to your article. IMO Olympus should pay you as a consultant! Most of your suggested improvements, if not all, seem to have been incorporated as well as a few extra ones. Impressive on many levels (competitors take note)...the only downside for me is, having narrowly settled on Tascam's DR40 with plans to purchase one in the next couple days, I now am questioning that choice...of course, there are certainly worse problems to have! First, thanks for your kind comments, Fred. Would that Olympus pay me for some consulting! But I am sure they have their own usability and testing team. I consider the LS-100 to be in a different class of recorder, since it is significantly larger. Looking back at my original Summary of Portable Digital Audio Recorders, it falls right in the middle of the "Hand" class. You're not going to hide this one in a small pocket like you can with the LS-3 or LS-7. Neither, by necessity, will it provide the excellent battery life of its smaller brethren, but that is the price of true phantom power. I await some testing but to see whether the pre-amps correspond to the superior circuits in the LS-11/10/5. I certainly hope so! I would be content with the Tascam DR-40, which has positionable microphones, four-track recording and the nifty dual recording mode that can simultaneously capture a safety track. I don;t think the LS-100 has any of that. And the Olympus unit is not available for two months. When you connect an external mic to the mic jack of LS-11, the frequency response range will be from 60Hz to 20kHz that is the same as the built-in stereo mics. The maximum value of the frequency response is also limited depending on each recording mode as well. I have been been following this site in order to decide between the Olympus LS-11 or the Sony M10. My application is almost exclusively voice overs for video productions so close micing is no problem. I specifically want an easy to use device with minimum fidling with buttons. Given this application which do you think will suit me best please? Best regards and thanks for a useful and readable review. I am sure either would suit you; it is only using both that is annoying, since different decisions were made by the designers as to button presses etc. All the key buttons are nice and big on both and the screens are readable. I am wondering why you'd use a portable recorder for VO work. How do you sync to the bed or guide track? I am going to plump for the Olympus LS-11 as I have borrowed one to try and compared it to a friends Sony M10 and the Olympus seems to score on useability. I don't expect any significant difference in the recording quality which I expect wil be will be unoticable. Re your second para, I usually record the VO and then edit the video to fit so syncing is not a problem. If I needed lip sync I would record directly to the camera. Thanks for your invaluable help through the thread. Your comments are valuable and easy to understand which is great. It's perfect that you got to try both devices -- nothing beats hands-on experience! Thanks for your kind words. Yes, 2013... though three years have gone by not much has changed in the world of small digital recorders. I have never owned the Sony D50, but nonetheless search for "D50" on this site. You will find a series of articles that compares the salient features of the whole crop of available recorders. There's a table that indicates the D50 is 4dB quieter than the M10. It simply has better pre-amps. I have never read of anyone disappointed with that unit! Though for me I'd want XLR inputs on a recorder that large. It is twice the size and weight of the M10. Paying a fortune for it might not make sense. But finding one at a good used price might just be the ticket! I have read some posts here. I used the tascam 5 and the sony pcm 10.
the tascam automatic mode is very susceptible. when there are many winds and crescendo the auto is easily unable to cope and there is distortion, noticeable as crackling and volume changes because of the auto modes regulation. the sound is clear but has higher noise floor. the sony, as I have found out, has omnis. and yes, microphone placement is therefore more important. so at best nearer to the source eg. the conductors podest. Otherwise the audience is going to recorded. the sony pcm 10 is not so clear (in the whole frequency spectrum) and the stereo effect not so present compared to the ls 11 and tascam 5. BUT, in a church I don't want to record people coughs, rustling, crackling or even falling rain etc. I want to record the bass of the organ and die violin. Therefore this less clarity could be a plus for the Sony. For nature sciences however, I can imaging that the ls-11 is better, because every rustle and crackle is important to be as much authentic as possible. It seems that the auto and high sensitivity works for many situations also with quite high inputs near a sound source or orchestra. that's a plus for the sony. the noise floor of the sony is low, so some audio gain is possible later with software. artists do not like too much technics so the sony seems to be quite good. these are my experiences with the tascam 5 and sony pcm 10. Smaller stone church, 2nd row, completely left side (came too late, allemande is from cheap notetaker), sony pcm 10, auto mode, high sensitivity, strad in the middle in front of first row. For a point source of echo with reflection like a church the sony pcm 10 works quite well. For some instruments like a Cello in low frequencies, I have noticed that the pcm 10 is not always very correct in the instruments true sound authenticity. more stereo and surround capture would be better. eg. Zoom h2n (cheap = bigger noise floor) or the next more expensive with less noise floor Olympus LS-100 (up to 400$ tag), Sony D100 (1000$ tag), maybe with ext. microphones. I've read this post and a few others with interest. I am looking for a digital recorder to record my violin practices, my lessons with my teacher, practice sessions with other musicians, and small concerts at our music school. I currently record at home with an AT-2020 XLR mic that I use with an m-audio fast track ultra and Reaper on the PC. At home I'd like something quicker where I can just push a button and record with built-in mics, and of course something portable to take to classes. I was planning on getting the Zoom H5. That way I could use the built in mics OR have the option of using my AT-2020 at home. Do you think the zoom H5 is a good choice? I think the Sony M10's omni mics will not be a good choice for me. The zoom H5 is about 250 euros which is my budget. (I currently use my telephone so any digital recorder is going to be a huge improvement!). Is the H5 a good choice for me? The Olympus LS-14 is slightly cheaper (about 200 euros), but lacks the XLR input. If I didn't already have an XLR mic then this wouldn't be an issue but since I already have one I am leaning towards the zoom so I can use it. It seems the H5 is an improvement over the H4n. Zoom recorders are perfect for people on low budgets who want to record relatively loud sounds, like a live performance, instrument practice, or film dialogue. The Zoom H5 seems fit for these tasks. As a field recordist, I generally prioritise recorders that have more solid build than the Zooms, and quieter pre-amps. In the Olympus range you would have to go to the LS-100 to find a model with XLR inputs and phantom power. The extra costs buys you cleaner pre-amps, but that might simply be something you don't need. Hi, thanks for the reply. Low budget is pretty much me, since I wouldn't be doing anything professional with the recordings and most of them would probably even be temporary in nature that would get deleted after a few weeks (replaced by new ones). I've heard the H5 had a big improvement over the H4n for quieter pre-amps. The LS-100 is 100 euros more (350 vs. 250). I like that it's smaller and lighter, but it might be overkill for me.